A UN official said the radiation reaching America is ‘about a billion times’ beneath health-threatening levels. An airborne plume of radiation is expected to be swept towards Europe, and again officials stress that the levels reaching the UK will not be high enough to pose any risk to human health. Lars-Erik De Geer of the Swedish Defence Research Institute, said particles would eventually be detected across Europe. The prediction that particles could reach Britain within two weeks is based on previous data, gathered by scientists observing nuclear testing in China. Meanwhile, workers at the devastated power station are continuing their desperate battle to prevent a complete meltdown which some fear could be as bad as Chernobyl. 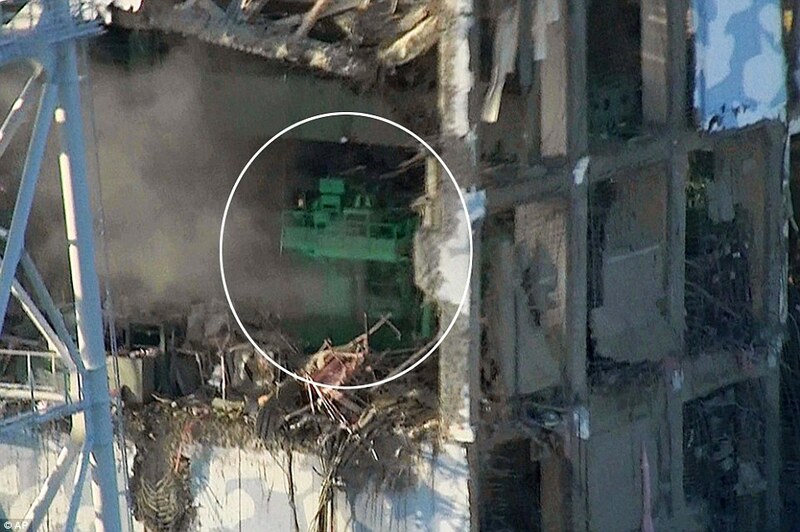 The latest pictures show a whole wall missing from the building housing reactor number four. Inside, a green crane normally used to move spent fuel rods into the storage pool can be seen. Underneath the crane, but not seen in the picture, is the 45ft-deep spent fuel storage pool which has boiled dry. Officials at Fukushima are rapidly running out of options to halt the crisis. Military trucks are spraying the reactors for a second days with tons of water arcing over the facility. Engineers are trying to get the coolant pumping systems knocked out by the tsunami working again after laying a new power line from the main grid. And they today admitted that burying reactors under sand and concrete – the solution adopted in Chernobyl – may be the only option to stop a catastrophic radiation release. It was the first time the facility operator had acknowledged burying the sprawling 40-year-old complex was possible, a sign that piecemeal actions such as dumping water from military helicopters or scrambling to restart cooling pumps may not work. ‘It is not impossible to encase the reactors in concrete. But our priority right now is to try and cool them down first,’ an official from the plant operator, Tokyo Electric Power Co, told a news conference. But some experts warned that even the concrete solution was not without risks. ‘It’s just not that easy,’ Murray Jennex, a professor at San Diego State University in California, said when asked about the so-called Chernobyl option for dealing with damaged reactors, named after the Ukrainian nuclear plant that exploded in 1986. ‘They (reactors) are kind of like a coffee maker. If you leave it on the heat, they boil dry and then they crack,’ he said. And Yukiya Amano, the head of the U.N.’s International Atomic Energy Agency said workers were in a ‘race against the clock’ to cool the reactor. Attempts to quell the overheating plant with waterbombs from helicopters yesterday failed and despite the army pelting the site with water cannon, radiation levels rose higher. Engineers are also working to restore power to the coolant pumping system knocked out by the tsunami. Japan’s Nuclear and Industrial Safety Agency admitted that the disaster was a level 5, which is classified as a crisis causing ‘several radiation deaths’ by the UN International Atomic Energy. Officials said the rating was raised after they realised the full extent of the radiation leaking from the plant. They also said that 3 per cent of the fuel in three of the reactors at the Fukushima plant had been severely damaged, suggesting those reactor cores have partially melted down. 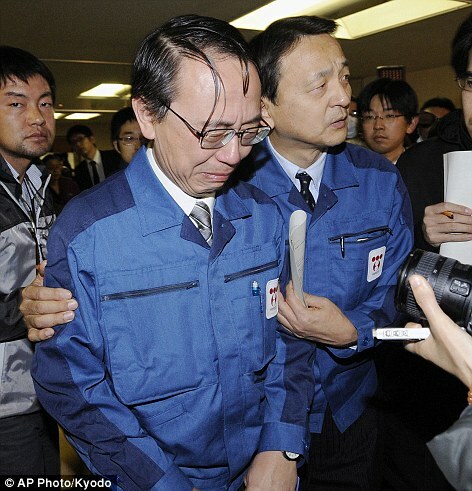 After Tokyo Electric Power Company Managing Director Akio Komiri cried as he left a conference to brief journalists on the situation at Fukushima, a senior Japanese minister also admitted that the country was overwhelmed by the scale of the tsunami and nuclear crisis. He said officials should have admitted earlier how serious the radiation leaks were. Chief Cabinet Secretary Yukio Edano said: ‘The unprecedented scale of the earthquake and tsunami that struck Japan, frankly speaking, were among many things that happened that had not been anticipated under our disaster management contingency plans. Nuclear experts have been saying for days that Japan was underplaying the crisis’ severity. It is now officially on a par with the Three Mile Island accident in Pennsylvania in 1979. Only the explosion at Chernobyl in 1986 has topped the scale. Deputy director general of the NISA, Hideohiko Nishiyama, also admitted that they do not know if the reactors are coming under control. It comes after pictures emerged showing overheating fuel rods exposed to the elements through a huge hole in the wall of a reactor building at the destroyed Fukushima nuclear plant. Radiation is streaming into the atmosphere from the used uranium rods at reactor number four, after a 45ft-deep storage pool designed to keep them stable boiled dry in a fire. And some of the radioactive material could reach Britain within a fortnight, according to experts. However they say it will not be dangerous when it reaches our shores while low levels of radiation have already hit Southern California. Mr Naoto Kan, yes you will rebuild Japan from scratch but after how many years? The radioactive polluted area around FuKushima will remain uninhabitable for couple of decades. As a leader of an advanced country you could have stopped this catastrophe by forcing TEPCO to act faster and could have prevented it by enforcing stronger safety regulations. In the end common man is the real loser.